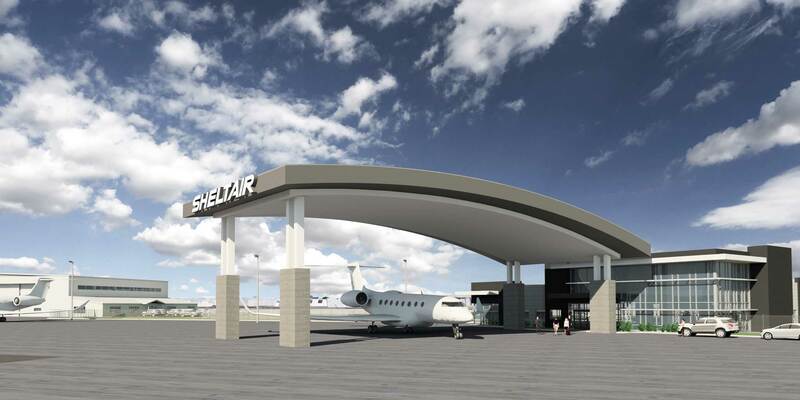 An artist rendering shows the planned new Sheltair FBO at Colorado's Rocky Mountain Metropolitan Airport. When completed early in 2020, it will be the second service location on the field. Sheltair Aviation is expanding from its U.S. East Coast-area of operations to its first location west of the Mississippi River, it announced this week. The company has entered into a long-term lease with Colorado’s Jefferson County to construct and operate a full-service FBO at Denver-area Rocky Mountain Metropolitan Airport, the fourth busiest airfield in the state. Its initial 20-year term includes an option for a renewal of up to 20 years, which would then allow the company to expand its leasehold by another 25 acres. Phase I of the project costs approximately $12 million and calls for a 10,000-sq-ft terminal with airside arrivals canopy, a new 35,000-sq-ft heated hangar capable of sheltering large-cabin business jets, eight acres of apron, and a new fuel farm on the 10-acre plot. Groundbreaking is slated for March 2019, with an anticipated opening in the first quarter of 2020. It will be Sheltair’s 18th FBO overall, and the second service provider on the field.